The world economic rebound, which began in earnest in late 2016, appears to be widespread and sustainable. Global strengthening is a significant tailwind for U.S. manufacturing whose improving fortunes have been further buttressed by a nearly year-long depreciation in the still elevated dollar. The combined impact of Hurricane Harvey, which descended upon south Texas and Louisiana in late August, and Hurricane Irma, which descended upon Florida in early September, adds a significant element of uncertainty to the late 2017 and early 2018 outlook for U.S. factory sector performance. All told, however, the MAPI Foundation’s forecast remains almost completely unchanged from our June and February 2017 reports. We currently expect average annual U.S. GDP growth to be 2.2% from 2017 to 2020. Beyond the impact of the destructive hurricanes, recent history has shown that current global uncertainties and turmoil can quickly present head- or tailwinds to future U.S. growth. In June 2017 the MAPI Foundation began to respond to these challenges, exploring the boundaries of plausible factory sector growth through 2020, by simulating alternative scenarios for global growth and the dollar. Currently, such analysis suggests a range for average manufacturing growth of between 1.5% and 2.2%. Thus, while U.S. manufacturing output gains are accelerating from the weak 2013-2016 period, a return to the growth rates of the 1990s or even the early 2000s remains unlikely even as improved global economic performance and a modestly more competitive dollar increase the upside potential for U.S. manufacturing performance. The MAPI Foundation’s current projections for growth in U.S. GDP, as well as key components of GDP through 2020, are partially based on the low likelihood of recession before 2020. Relatively low interest rates and the non-zero probability of fiscal stimulus will at least enhance growth over the short-term, contribute to this prediction. The four-year outlook for U.S. manufacturing growth and growth in major manufacturing subsectors is moderate. We anticipate constraints in the short-term due to a range of uncertainties from economic and manufacturing volatility in the wake of the hurricanes to escalating geopolitical and trade tensions. Over the longer-term, the aging population and slowing of labor force growth will slow potential GDP growth, a troubling problem that can only be neutralized bya measurable improvement in the weak productivity picture. 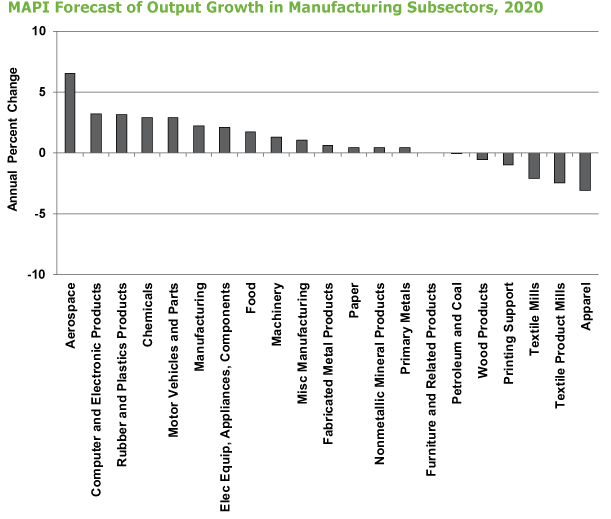 The manufacturing subsector outlook picture continues to show a pronounced schism between growing and declining subsectors. Textile mills, textile product mills, and apparel all have a notably bleak short-term outlook as they continue their long-term decline in the U.S. domestic manufacturing base. The 2017-2020 forecast for apparel, for example, calls for an average annual decline of 5.3%. Textile mills is projected to have an average decline of 3.2% over the same period, while textile product mills is modestly less bleak with a forecast of an average decline of 1.8%. Overall U.S. manufacturing growth, productivity, and competitiveness are going to be increasingly catalyzed by the export of high R&D business machinery and certain areas of transportation. The machinery subsector has a positive outlook that is catalyzed by an improvement in the pace and breadth of global economic and global manufacturing growth. Nonetheless, our current forecast of 2.5% average growth through 2020 is weaker than the 4.2 % average growth that we projected for this sector in our June 2017 report. This is consistent with the markdown of our capital spending forecast that has occurred since our February 2017 report. The progressive weakening of our capital spending outlook has been motivated by consistent disappointment in the pace of U.S. economic growth and rising uncertainties for U.S. economic performance over the medium-term. The ongoing housing recovery, as well as the need for hurricane-related rebuilding, partially underlies our strong near-term forecast for the wood products subsector. We project that wood products output growth will be 3.5% in 2017 and 3.7% in 2018. While the hurricanes have adversely impacted the 2017 growth outlook for the chemicals subsector, growth in this industry retains a moderate to bright outlook. Chemicals growth in 2017 is only predicted to be 1.1%, but average growth through 2020 is expected to be 2.6%. Except for apparel and textile product mills, which have been challenged subsectors, the growth outlook in the consumer-related industries remains moderate, although somewhat weaker than seen in our June 2017 report. The outlook for investment-related industries reflects the persistence of historically sluggish U.S. capital spending growth combined with a strengthening and stabilizing the global economy. The stable outlook for metal working machinery growth and industrial machinery growth, both somewhat weaker than in our June report, is mostly the result of improved U.S. manufacturing prospects. The pronounced turn in drilling equipment performance, from a 24.4% contraction in 2016 to projected 20.4% growth for 2017, is largely due to renewed stability in oil prices after a sharp slide that began in mid-2014 and bottomed in early 2016 as well as stable, if not strong, U.S. economic growth. As the global economic recovery matures and as globally sensitive materials prices enjoy an ongoing rebound, the outlook for growth in many key materials-related industries has stabilized. The picture is mixed, however, as weakening short-term prospects for iron and steel production and lingering weakness in paper production are offset by strength in glass, resins, and chemicals. Recent data releases, most notably the August industrial production report from the Federal Reserve and the September jobs report from the Bureau of Labor Statistics, show that Hurricane Harvey and Hurricane Irma have injected a measure of volatility and uncertainty into the short-term U.S. manufacturing growth picture. It remains clear, however, that U.S. manufacturing performance is benefitting from an ongoing global economic recovery which has been enhanced by a nearly year-long fall in the still elevated dollar. While there are no stellar growth leaders in the still lackluster manufacturing picture, machinery, chemicals, aerospace, and computers will continue to be catalysts for improving manufacturing performance. These will be the subsectors most responsible for moving U.S. manufacturing beyond the nearly stagnant growth in the 2013-2016 period. The outlook for consumer-related industries reflects a moderate consumer spending picture. Investment-related industries have a more mixed outlook reflecting the improved manufacturing growth that has benefitted from global factors but, at the same time, still weak domestic capital spending. Full details from the Foundation’s global growth forecast are available in Growing Upside Potential for U.S. Manufacturing Growth.